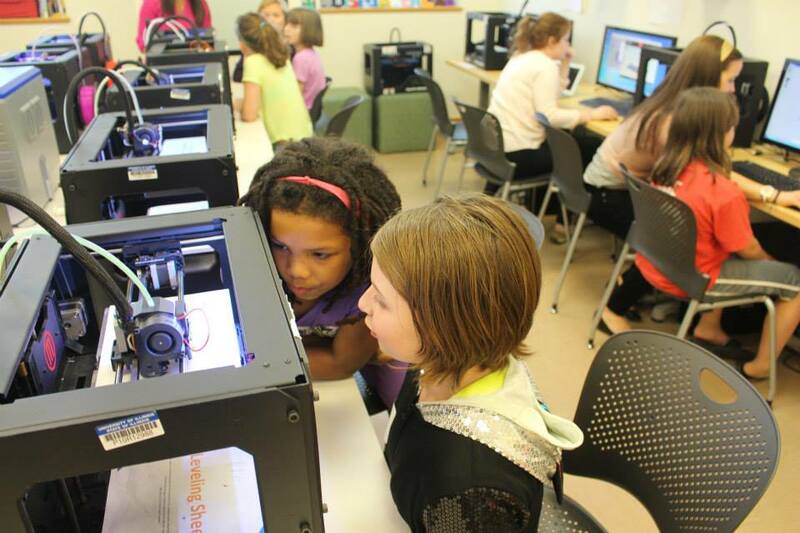 Two girls participate in a MakerGirl workshop this spring. Registration for summer workshops is now open. Photo Credit: MakerGirl. A group of University of Illinois students and graduates are on a mission to change the world by getting more young girls interested in math and science. MakerGirl, a grassroots team of 15 young women, educates 7- to 10-year-old girls on STEM (Science, Technology, Engineering, Mathematics) fields through 3-D printing workshops. The group, which is pioneering its own way as the first of its kind, is expanding its reach to Southern Illinois in July and hopes to expand to the Chicago area by the end of the summer. In the future, MakerGirl plans to purchase a truck to reach rural locations as well. The idea for MakerGirl came from a social entrepreneurship class last fall. Students were directed to share what drove them, what bothered them, and then were asked to create a way to combat the problem. Elizabeth Engele, a recent graduate of the University of Illinois and one of the co-founders of MakerGirl, said one thing that bothered her was how her female peers were focusing energy on negative things. Engele said she wondered what would happen if they could focus their energy on things that could change the world. “A lot of girls are good at math, science and technology but they don’t have female role models in their lives that will encourage them to pursue these fields in college,” she said. So Engele and two fellow students, Julia Haried and Sophie Li, decided to start MakerGirl to encourage young girls to explore both their creative and analytical sides. MakerGirl piloted its first session last fall with workshops at the 3D printing lab in the Business Instructional Facility at the U of I. The workshops were positively received by parents and girls with a 90 percent approval rating by parents. Participants used 3D printing equipment to design and create things like plastic hair clips and key chains. “(The workshop) takes them from concept all the way to having an item in their hand when they leave a session,” Engele said. Several workshops and even a camp are being held this summer. The cost is $20 per session per girl. Scholarships are available for those in need. The first summer workshop starts June 9. Engele says the workshops are a place where girls can make friends, be creative and have fun with technology and each other. “This is a session that really shows them that STEM can be fun. All the girls end up having a great time and being exposed to a real-world example of what STEM is,” she said. For more information about MakerGirl, please visit its website or Facebook page. If you have questions or are in need of a scholarship for a workshop, please contact makergirl.uiuc@gmail.com.